Hello & Happy Hump day Wednesday to ya! Such a sweet card! You used some happy papers that scream "happy birthday", these will surely be enjoyed by the recipient! I take a couple days off to do school work and you have been creating masterpieces. I sure have missed out! They are all magnificent! This card is gorgeous, Theresa!! Love the pretty papers and fabulous design!! You did a awesome job my friend!! Have a great day. You sure are whipping out some impressive birthday cards!!! I love this one as much as those you have already posted!!! The papers, the cuts, the design and layout. Most fabulous!!!! This is a really beautiful card! I love the papers and colors... and you sure have been busy since ya got back! Lovely card! This is super! Love the bold colours with that fabulous sun! I'll bet the teacher LOVED it! I am really loving this card! The beautiful colors and the woodgrain texture with it is a great touch. 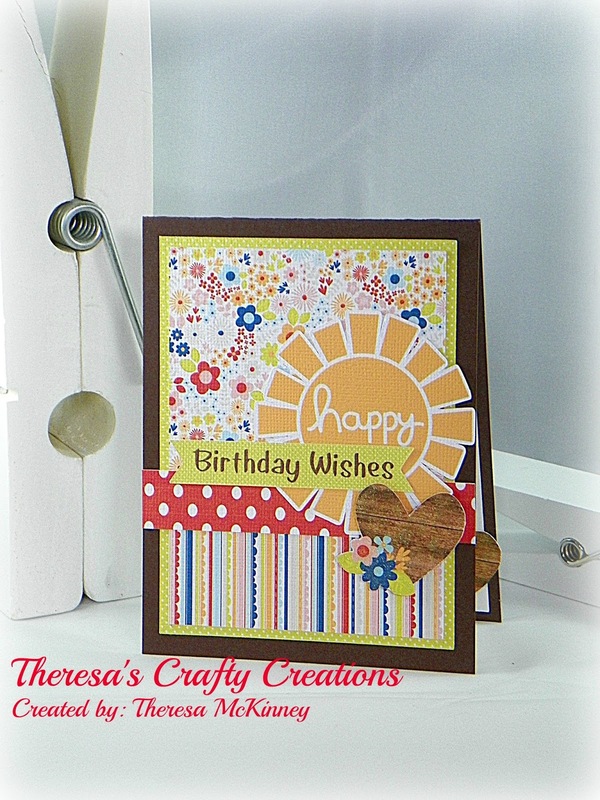 This is such a pretty, cheerful card. I love all the prints and bright, happy colors. This card is such to put a smile on someone's face!